On Second Scoop: Ice Cream Reviews: How do you feel about salt on cookies? How do you feel about salt on cookies? Today, one of my vendors was nice enough to bring in several cookies for me and my coworkers. Since technically he was there to see me, it seemed only appropriate that I claim dibs on the biggest cookie in the Panera box. This is the kitchen sink cookie. It's pretty obvious that this no mere cookie but checking out the Panera website reveals it to be a mighty 800 calories. That's a hearty lunch right there my friends, but in it's defense, the website points out that it's "big enough to share". 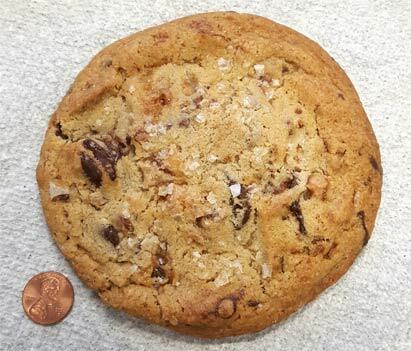 The cookie contains semi-sweet chocolate, milk chocolate, caramel pieces, pretzels, and flake salt. Wait, flake salt? You mean those aren't giant sugar bits on top?! Curse your trendiness Panera! I get the whole salty and sweet thing, but not like this and not on my cookies! Salt crystals this big are basically mini salt licks. I picked off what I could but the salt factor was still very prevalent. Did I resist (finishing) the 800 calorie cookie? Yes I did, but I think it's more about salt than self control in this instance. It wasn't exactly filling and I could have easily inhaled a non-salted version. I'll probably eat the other half tomorrow morning, but I'll be honest, the salt factor really does make me question if that many calories is worth it. There's just no need for that much salt. Has anyone else had this tasty yet salty cookie? Have I scared anyone off? I said that -I- didn't like the salt factor and then asked for people's opinion on it. There's no need to respond rudely. My birthday falls in July. Annually I get a free pastry certificate in my online Panera account. So this past summer I was visiting in Maryland with my children and decided to get my free pastry. I asked if it included this huge Kitchen sink cookie, and they said "yes." That seemed like the best deal so I chose this cookie. I totally agree with you. The salt factor was off-putting. I prefer some of their other pastries. Although I did try the new cinnamon roll this summer as well and found it to be a little hard. I prefer a softer cinnamon roll. Now I split this huge cookie with my five-year-old twins. Even they did not care for it. I think I'll stick to their scones and other cookies from now on. They do make good frosted sugar cookies with seasonal flair. Yeah, they make fine cookies, I've had them before, I just don't like the salt on top. Even if you scrape it off, it's still ingrained in the cookie (you can still taste straight salt). There were four of the pumpkin shaped sugar cookies in the box as well, but I wanted the huge cookie all to myself. Not for me. :) If it's going to be sweet, I want it all sweet. Having salt on cookies actually increases the sweet taste (which is why sweet recipes call for salt). Saying that, it can be overdone. The salt on the cookie in the picture looks more like coarse kosher salt, opposed to the fluer de sel I have used on cookies and caramels in the past. I'd probably pick out the chocolate chips, but thanks on the information about salt and it's enhancement on sweet! I love salty cookies and foods in general. I've never had a Panera cookie before, in fact I have only had a bagel from Panera once in my life.. Even that was probably almost a good 15-20 yrs ago! Anywho.. I love Arby's salted caramel cookies, so I'm sure I'd enjoy this as well. I should plan a lunch date at Panera one day ,to share their baked goodies. I do think salt brings out sweet flavors very nicely, but that looks pretty intense. I don't even understand why salted caramel is popular. Too much salt negates the enjoyment for me. I don't like salty with sweet. I need to keep mine separate to enjoy. All that salt would have ruined the cookie for me. I've been salting the tops of my homemade cookies for a year or so. Yum. I'ma a pastry chef and a salt-fiend. The extra salt is better IN the dough. A consistent salt-enhanced flavor is much better than shocking the palette with a huge patch of coarse salt.